Support | EnviroSeal Engineering Products Ltd.
SpiralTrac™ is distributed worldwide, so wherever you are there's a distributor nearby. Use the form to search by country, or if you are looking for a specific company you can search by name as well. We can also help you locate the closest distributor in your region, send us a quick message and we'll get back to you shortly. If you are a distributor and you aren't listed, please contact us so we can fix the issue. The information is correct to the best of our knowledge. EnviroSeal has been in business for over thirty years, and in that time we learned a lot about the industry. Our applications engineers gained unmatched experience in sealing solutions, we have and keep providing support all over the World. The SpiralTrac technology is a very unique product and a definite game changer in the pump sealing industry. Just browse away in our library section among the incredible success stories we collected throughout the years. We know that our product makes a difference so we make each device count. Our workflow starts with information gathering. A filled out order form can tell us most vital information we need to start production. Each order is evaluated by our engineers and we follow up right away if something seems out of place or unusual. However, an order form is not required. If you get in touch with us about an application, we can ask the right questions. Over the years we have come across countless challenges to know which direction to take, and of course new challenges are always welcome. And though most applications would benefit from the SpiralTrac geometry, if we feel like it wouldn't make a difference we will offer you solutions without SpiralTrac. Over the years customers have come to us with split bushing manufacturing requests, as they know at EnviroSeal they will find a solution. If we can manufacture what you need, we'll make it happen. Once we have all the info we need, the design process begins. Using professional engineering software, once the design is finalized we can send a visual drawing upon request so you know exactly what you were getting. We manufacture each device up to 14" diameter in house. Our skilled production staff works with the highest quality standards, and we make sure that each device is within spec. Certificate of compliance can also be requested at no additional cost. So contact us, you can trust us with your sealing solution. Get the information you need in the Literature section. You can find Brochures, Order Forms, Istallation Instructions, Success Stories and more. Our equipment's shaft moves axially. Will this affect SpiralTrac’s operation? No, since SpiralTrac does not contact the shaft. The SpiralTrac does not rotate. SpiralTrac's patented design creates new and unique flow patterns from existing flows caused by shaft and sealing element rotation. Can a SpiralTrac be used with Latex or Paint? Generally, a SpiralTrac cannot be used for most latex compounds or latex based paint because the exit groove would be blocked by the material, and the functionality of the SpiralTrac would be degraded as a result. Can a SpiralTrac be used with a dry powder? No, SpiralTrac is designed to operate in a fluid only. Where should the SpiralTrac not be used? SpiralTrac should not be used in any application where the process is at or near vapor margin. In this situation, any increase in temperature or decrease in pressure could cause flashing. Depending on the process, SpiralTrac may slightly change this condition, and we don't recommend taking the risk. How do I determine the rotation of the SpiralTracs required in my double-ended pump? There should be one left-hand rotation device and one right-hand rotation device (either packing or mechanical seal versions). Direction of rotation is determined from the motor end looking towards the impeller. What is the maximum process temperature that an ESC/GLF SpiralTrac will handle? The maximum process temperature we recommend is 250oF/120oC. If your process temperature is higher than this, you should consider using a metal SpiralTrac. What is the largest-sized contaminant that SpiralTrac can handle? The radial clearance between the shaft and inside diameter of the SpiralTrac is 0.020"-0.040" / 0.51mm -1.02mm. Upon flooding of the pump, contaminants larger than this size cannot enter the seal cavity. Contaminants this size or smaller that do enter the seal cavity are easily removed by SpiralTrac. Should a larger piece of contaminant enter the seal cavity through the flush port, the SpiralTrac will attempt to remove it. This larger contaminant will be crushed to a smaller size between the shaft and SpiralTrac, resulting in complete removal through the exit groove. How do I know which material to specify when ordering SpiralTrac? EnviroSeal offers SpiralTrac in a number of materials: ESC (carbon-graphite filled PTFE), GLF (glass-filled PTFE), 416 & 316 stainless steel, bronze, and titanium. The material selection depends on the application and is normally made by the customer to fit the required needs. Often, the SpiralTrac is constructed of the same material as the pump, and since it is a machined product, it can be made from just about any machineable material. Consult EnviroSeal to determine which is best suited for your application. Will SpiralTrac mechanical seal versions work with packing? No, the seal versions of SpiralTrac are not designed to work with packing. The only SpiralTrac that is specifically designed for packing is the Version P.
What is the difference between the Version D and Version N? The Version D and Version N are both used in mechanical seal applications and are installed similarly: however, they differ in the length of the devices and the applications that they are used in. The Version N SpiralTrac is designed to be used in applications where non-fibrous particles such as silt, sand, etc. are typical. Particles of this type separate based on density: thus, heavier particles centrifuge to the bore where the SpiralTrac collects them and moves them out of the seal cavity into the process and away from the seal. The Version D has a double spiral and is therefore longer than the Version N. It was designed for applications where the product is fibrous, such as pulp, corn mash and municipal wastewater applications. The double spiral provides greater capacity to move material out of the seal cavity. A Version D used in an application with non-fibrous particles could prematurely erode the pump and seal as a result of this increased movement of abrasive material. If you are unsure whether you should use a Version N or Version D, please contact EnviroSeal for assistance. How do I tell if my SpiralTrac (seal version) is installed correctly? For SpiralTrac Versions D and N (with an integral air vent), the air vent must be in the 12 o'clock position. Double-ended pumps: There should be one left-hand rotation device and one right-hand rotation device (either packing or mechanical seal versions). Direction of rotation is determined from the motor end looking towards the impeller. Should I be using hard faces or soft faces on my mechanical seal when I have a SpiralTrac installed? It depends on the application. If solids are removed, there are certain applications where the less expensive and cooler running soft faces can be used where only hard faces were used previously. Consult with EnviroSeal to determine your application's suitability. How much clearance is between the SpiralTrac ID and the OD of the shaft? The typical clearance between the SpiralTrac and the OD of the shaft is .018" / 0.46mm radial, but this can vary depending on the size of the device and the material it is made from. My equipment uses a unique mechanical seal design. Can SpiralTrac be used with it ? Yes. SpiralTrac is designed to work with nearly any type or make of mechanical seal. Can SpiralTrac be used with double mechanical seals? Absolutely! 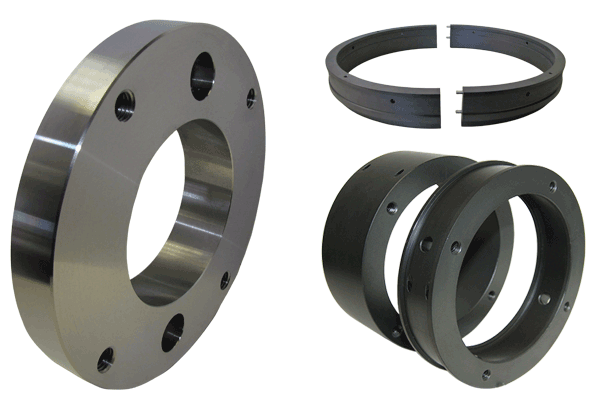 The problems associated with air and solids in the cavity are the same with double seals as they are with single seals. Double seals are expensive, and using SpiralTrac is an excellent, low-cost way of protecting your investment! What Types are Version D available in? The Version D is available in Type I (metals only), Type A, and Type E only. What Types are Version C available in? The Version C is available in Type I only. The drain must have a clear path to the impeller cavity in order to allow trapped product to completely drain from the seal cavity. What will the SpiralTrac Adaptor do to the turbulence in the stuffing box versus having the SpiralTrac fill up all the space in the box? The turbulence in the seal cavity will not be changed with the standard Adaptor. What is important is to protect the environment around the seal itself, and that is achieved with this design. An option, should you wish to control the turbulence in the seal cavity, is to order the Adaptor with a nose piece that will fill the entire void of the seal cavity. It is important to note that this option can be used only when there is enough first obstruction space available. What seals the halves of the SpiralTrac Adaptor from leaking? The two halves are machined to a polish finish to ensure total face contact when tightened together with the Allen-head bolts that are supplied with each device. As an option, a gasket sealant can be applied to each half for added sealing performance. What are the pressure limitations of the SpiralTrac Adaptor? The device has been pressure tested to 100 PSI / 689.47 kPa. The typical applications for the Adapter are well within this limit. Should you have a higher pressure application, we suggest you contact EnviroSeal. What seals the face of the stuffing box area when using a SpiralTrac Adaptor? The SpiralTrac Adaptor has been designed with a built-in gasket on the face sealing area. If the stuffing box face is in excellent condition, the built-in gasket should provide an effective seal. If the stuffing box face is damaged or eroded, there are options available to you. Firstly, you can insert an o-ring into the o-ring groove that is supplied with all standard configuration Adaptors, or secondly, you can order the Adaptor with a machined gasket groove in the face sealing area so that a flexible gasket can be inserted for an effective seal. For added sealing effectiveness, an appropriate gasket sealant can be used in either case. Is the SpiralTrac Adaptor Type S available in metal? Yes. Type S SpiralTrac Adaptors are now available in ESC, Bronze and Stainless Steel. Will SpiralTrac Adaptor work with no flush? At this time, all SpiralTrac Seal Adaptors require sufficient flush pressure to drive a positive flow into the box. We do not recommend or support running these devices flush-free. Have a question about an application? Need some clarification on SpiralTrac versions or help picking the best material? Our engineering team is here for you. Fill out the form and we can guarantee to get back to you within 24 hours. You may also call us at +1 (902) 861-3464 Monday - Friday 8 AM - 4:30 PM (ADT).